A new 47.2 metre Sanlorenzo 500EXP motor yacht has been sold by Lengers Yachts with delivery due in 2020. To be built in steel, the new explorer yacht sports takes advantage of the model’s extended stern area to accommodate a helipad. The model is an evolution of the 460EXP with exterior styling by Francesco Paszkowski, and features custom touches to accommodate the client’s wishes. Called the 500EXP in reference to her gross tonnage of 500GT, the explorer is able to carry tenders, boats and sail boats measuring up to nine metres in length, or even a seaplane or submarine. 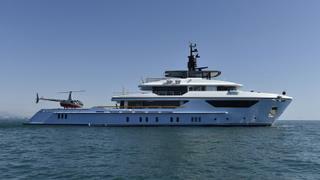 Its extended stern platform can be customised to include a helicopter landing pad. She features a lower deck beach-club with a bar which converts into a terrace overlooking the sea via a foldout door. A compartment on the main deck also houses a five-tonne crane, which can be used to move toys and tenders sitting on the stern. Powered by CAT C32 Acert or MTU 8V 4000 M63, the 500EXP can reach a top speed of 16 knots and, thanks to her 60,000 litre fuel tanks, has a range of 4,500 nautical miles at 11 knots. The asking price of the Sanlorenzo 500EXP has been withheld.